Nicolas Cage has an Oscar. He also has a son named Kal-El, a tattoo of a lizard wearing a top hat on his back, and is going to be buried in a pyramid in New Orleans when he dies, so let's not pretend he's any sort of run-of-the-mill celebrity. His quirkiness is legendary to the point where a measurable percentage of Internet memes are just things Photoshopped onto his crazy-looking face, because that in itself is good enough to go viral. But this persona wasn't foisted upon Cage, it was the result of decades of strange interviews, as well as bizarre, sometimes brilliantly acted roles by a guy who probably most accurately represents the phrase "crazy like a fox." 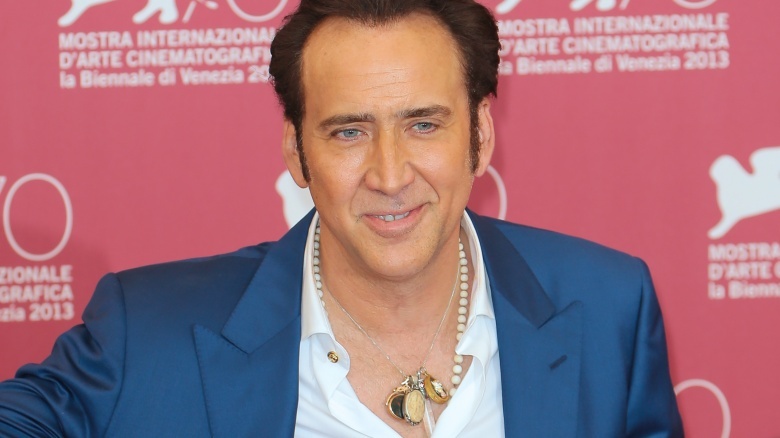 Here's a list of some of Nicolas Cage's most legendarily insane performances. 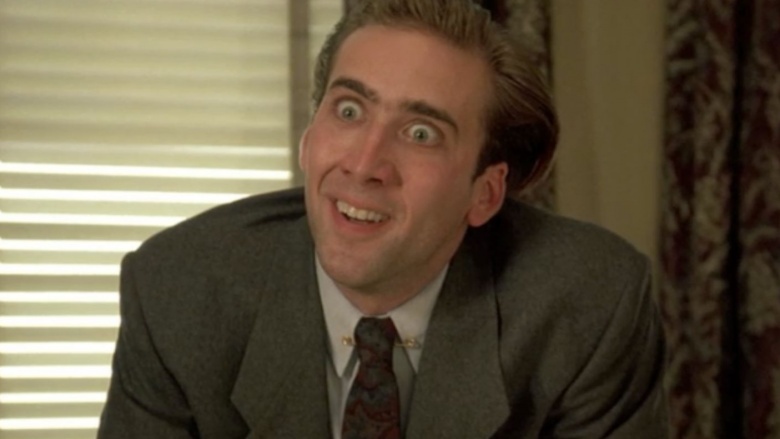 This is the movie that spawned the crazy-face freeze frame that's become one of the most ubiquitous Nicolas Cage memes. He stars as an already troubled guy who's now convinced he's turning into a vampire, so he goes around town begging for death, attacking women, and generally losing his mind. Some of this is done with novelty vampire teeth in his mouth (because he never grows real vampire fangs), which heightens an already ridiculous concept to absurd levels. Oh, and he eats a real, live cockroach in this movie, too, because running through the streets screeching "I'm a vampire, I'm a vampire, I'm a vampire!" must not have been achieving the level of nuance he was going for. 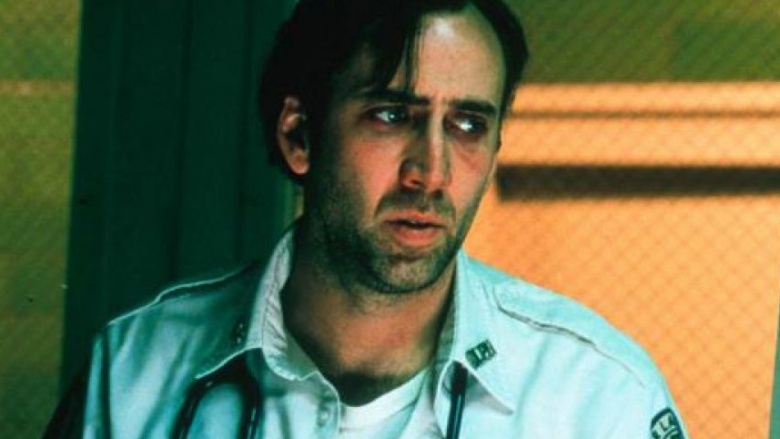 Vampire's Kiss was only the 11th film role of Cage's career, and by all rights could have been his last. But his brand of unintentional demented comedy was just getting started. If you were to find Nicolas Cage, David Lynch, Willem Dafoe, and Crispin Glover in a cookbook, it would be under a recipe for "Lunatic Stew." But the foursome managed to collaborate on what is arguably Lynch's most watchable movie in terms of straightforward narrative. Cage stars as Sailor Ripley, the slam-dancing ex-con who goes on the run with his girlfriend, Lulu, whose mother secretly plans to have Sailor killed. With his cowboy boots and snakeskin jacket—"a symbol of his individuality and belief in personal freedom"—Cage delivers a manic performance through a slipping southern drawl seems like it's supposed to be a nod to Elvis Presley, but sounds more like Dr. Phil acting like a tough guy. If you don't watch this movie for any other reason, you owe it to yourself to watch Sailor and Lulu karate-kicking and punching to the sounds of speed metal. And for Willem Dafoe's teeth. And for Diane Ladd's red-faced meltdown. And you know what? You should just go ahead and watch all of it. It's all pretty insane. The cocaine-fueled breakdown in which Nicolas Cage yells "Vive La f*@%ing France, man!" is almost a historical artifact in the annals of over-the-top performances, and it couldn't be delivered in a worse film. With a 0 percent score on Rotten Tomatoes, Deadfall has the overwhelming consensus of being terrible leveled against it. And if we're being totally honest, we haven't even seen the entire movie. But we have seen the infamous breakdown scene, that features Cage—complete with perv moustache and pearly veneers—spitting his lines through gritted teeth and with an intensity usually found in rabid animals or psychotics. The movie was written and directed by Christopher Coppola, Nicolas Cage's brother, so we can only hope that his performance was an intentional torpedo into the project to pay Christopher back for all those childhood wedgies. Martin Scorsese needed an actor who could play a hallucinating, sleep-deprived, and severely depressed paramedic in the middle of a hellish three-day tour of Manhattan night shifts. It was a role so tailor-made for Nicolas Cage, it's amazing they didn't name the character after him. 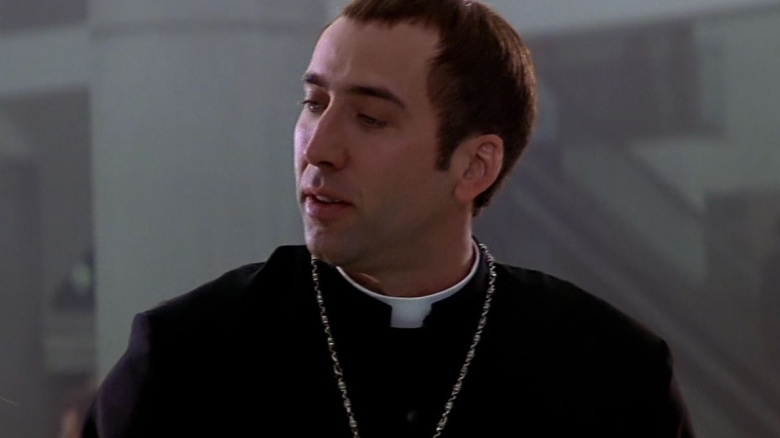 But where Cage's lunacy seems comedically out of place in some films, in Bringing Out the Dead his performance is spot-on, and even amplified by the equally nutty performances of Ving Rhames and Tom Sizemore. Cage plays a nerve-wracked, red-eyed tortured soul so well that in a moment where he accosts a man's suicide attempt for being pathetic, you actually take his side. The performance was crazy, yes, but it was the exact right amount of crazy, like the length of a bungee cord, or the friend whose number you keep because he has an uncle who knows how to "get things." 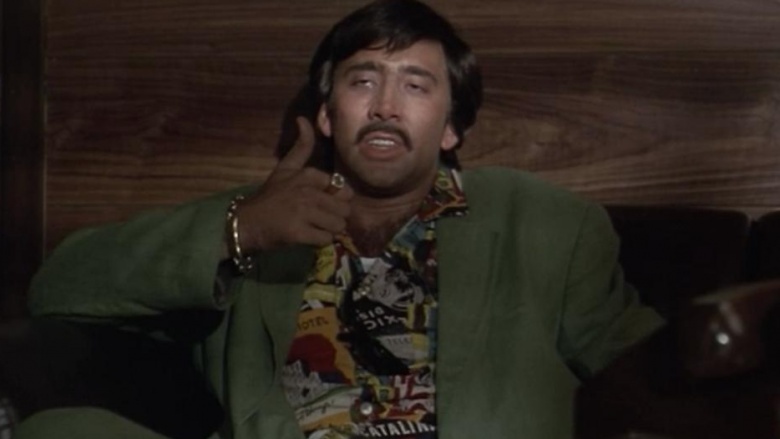 The flamboyant gangster character Castor Troy couldn't be more over-the-top if he was a hastily poured pint of beer, and if you think that's a bad pun, that's nothing compared to the dialogue Cage seethingly delivers as the antagonist in Face/Off. "If you dress like Halloween, ghouls will try to get in your pants," is just one of his lines, and even that pales in comparison to Cage's wide eyes, evil grins, and flashy, dancing displays of villainy that show how let-off-the-chain he was for this role. He seems to relish in killing people, ruthlessly mocks John Travolta's character over that time that he murdered his son, and even sings when he thinks he's about to die. Cage's performance only shined ridiculously brighter when he and Travolta switched faces meaning it was Travolta's turn to be bad, but he never stood a chance. Even Scientology couldn't prepare Travolta to out-Cage Cage in Crazytown, and that's saying a lot. Sonny is the only film Nicolas Cage ever directed. 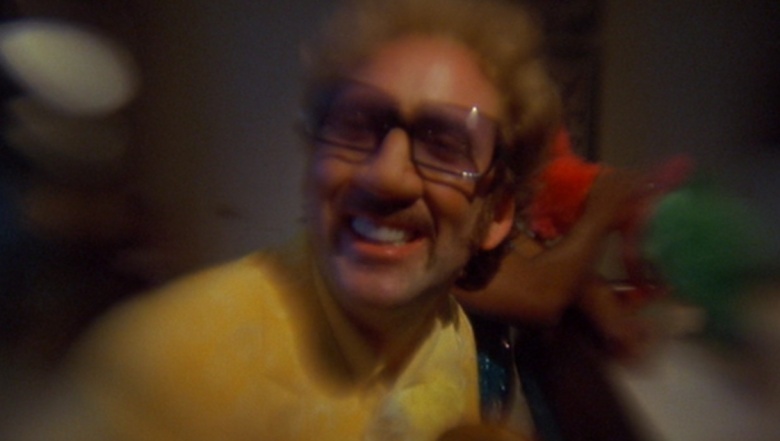 In it, Cage cast himself as the lecherous pimp named Acid Yellow, who perversely groomed the title character and gigolo, Sonny, who was played equally poorly by James Franco. Cage's wardrobe is the only thing worse than his performance, as he's dressed more like a Willy Wonka reject out of central casting than Don 'Magic' Juan. As he slips in and out of one of his patented sort of southern-ish accents, it would be easy to say, "Well, he was directing himself, so there wasn't anybody to rein him in," but this is exactly the kind of cuckoo character acting Cage often falls back on. We're pretty sure he's actually wearing an oversized prosthetic nose in the scene as well, just in case his "effeminate Col. Sanders whacked out of his mind on cocaine" impression wasn't solidifying this character's deviance. "Oh no! Not the bees! Not the bees!" If you're unaware of this line and scene from the remake of the 1970s cult classic The Wicker Man, then welcome to the Internet. You're going to be seeing and hearing this a lot from now on. 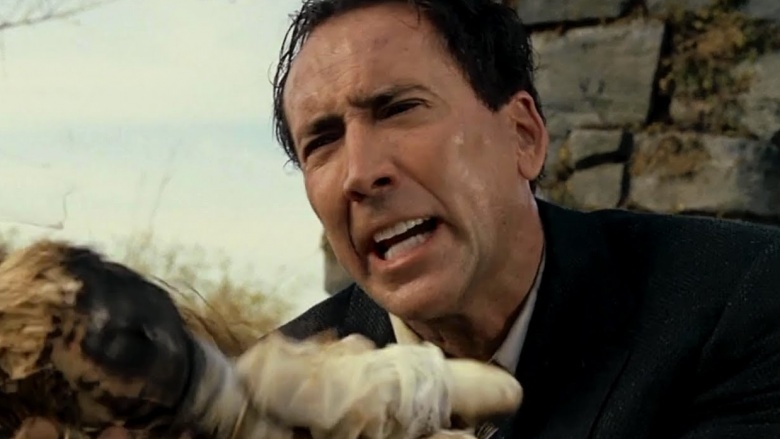 In another role that spawned a million memes, Cage plays Edward Malus, the police officer who goes to a mysterious island to search for his missing daughter, and ends up running around in a bear suit and punching women in the face. In the end, Malus gets tortured and burned alive. And while we admit it's unfair to judge a man's performance having never been placed in that horrific situation ourselves, we hope that if we ever are, our unintentionally hilarious reactions won't delight fans ironically for years. 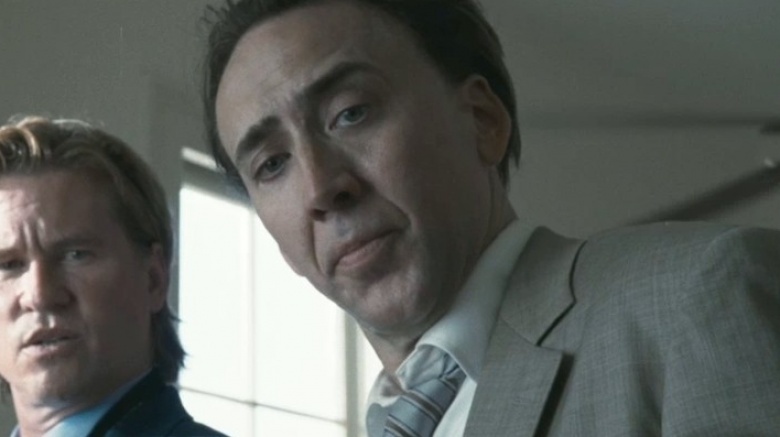 If you thought eating a cockroach and mocking a guy's suicide attempt were bad, then strap in, because Bad Lieutenant: Port of Call New Orleans is Nicolas Cage's pièce de résistance of outrageous performances. Sure, he does every drug imaginable, rambles incoherently while his co-stars helplessly try to maintain some semblance of the scripted scene, and threatens old ladies with a gun. And yes, he laughs like an absolute maniac, hallucinates lizards, and threatens just about everyone else in the movie in the most creatively obscene ways. But all of that pales in comparison to a single moment during a drug deal gone wrong. 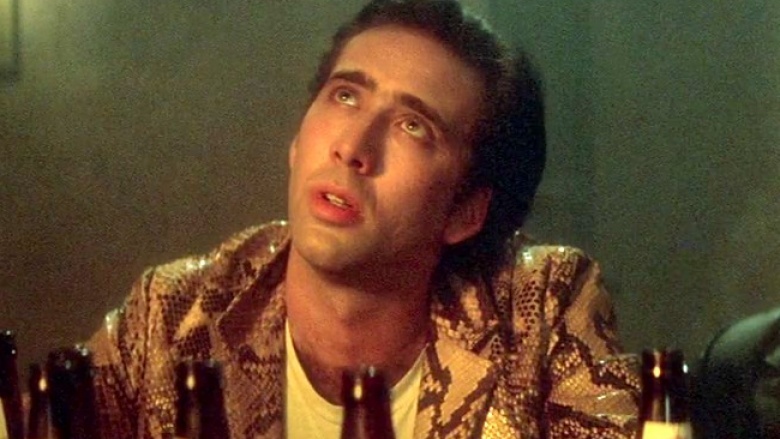 After a violent shootout, Cage locks into a glazed-over stare while he watches a dead guy's "soul still dancing." It's a moment so 100 percent Nicolas Cage that if you could bottle it and sell it, it would be his signature fragrance.